I’m 25 and work with the Arun team at the Pulborough & Ashington branches. I’d like to think I’m seen as an outgoing and happy person and enjoy a good laugh with perhaps a particularly creative sense of humour! Why did you want to become a veterinary nurse? Always a difficult question to answer, but I think the easiest way to describe my feelings towards my career are that I wanted to be able to help, in the broadest sense possible. 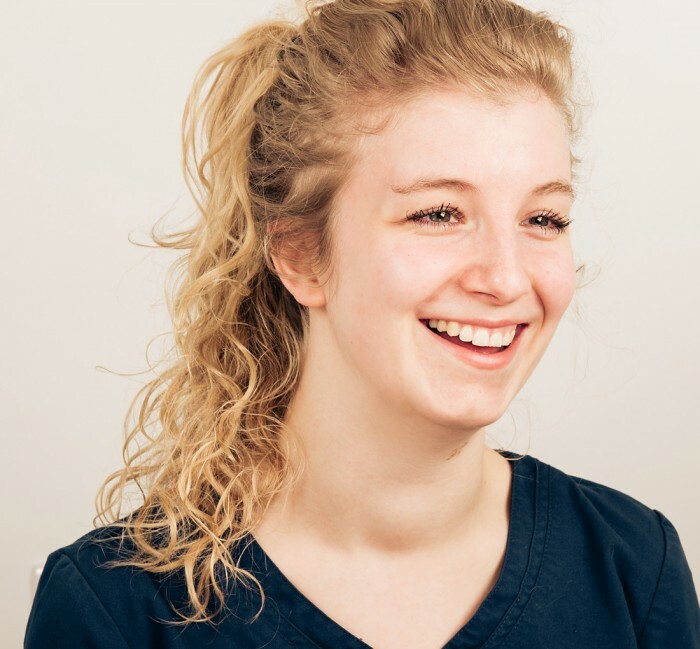 Being a qualified veterinary nurse I have gained the knowledge, skills and experience needed to be the best possible medical advocate I can be to my patients and their owners. My profession isn’t well known, and the skill set is often mistaken for that of someone employed to simply clean out kennels. I enjoy disproving this misconception, and will continue happily running around performing my millions of ‘nursey’ duties! How long have you been working as a veterinary nurse? I was a student veterinary nurse for 4 years and have been a Registered Veterinary Nurse for just over 3 years. Seems more like a lifetime if you ask me! You joined us in November 2014. What do you enjoy about working for Arun Vets? I love the team. They are all my little ‘vetty’ family and I wouldn’t be without them. In addition to supporting me and my ambitions, they are great fun to be around and always make the best of a bad day. The mutual desire for gold standard care makes for a very satisfying career. It’s a breath of fresh air being able to work to the best of your ability without feeling held back. Everyone works incredibly hard. The team is a force to be reckoned with when it comes to animal health and welfare and I personally wouldn’t want to challenge that!. I thrive in our nursing clinics! I currently run Arun’s weight clinics, a topic especially close to my heart after spending the best part of a year and a half on my canine obesity-related dissertation at uni. I find nutrition fascinating, especially when I have so many species to accommodate, although I tend to ignore my own good advice when there is cake in the surgery! I’m currently studying for a physiotherapy and rehabilitation certificate at Berkshire College and loving every minute. I have begun to practise physio at Arun, running our post-op routines and chronic pain clinics. It’s a joy to see our infirm pooches up and running again! You currently run our puppy parties, can you tell us more about these? Puppy parties are a little slice of chaos! Puppies are incredibly receptive between the ages of 8 – 18 weeks, and the experiences they gain at this age will largely govern the type of dog they will grow up to be. Our sessions are aimed towards encouraging a positive attitude towards other dogs, letting them learn their boundaries & body language in a safe and secure setting, whilst having the added benefit of desensitising the little beasties to the veterinary environment! Puppies need to have had at least their 1st vaccines in order to be eligible for the sessions, and can’t attend within 2 days of a vaccine being given. I have what might be referred to as a ‘moronic’ dedication to my work, which to be honest, I probably share with half of my colleagues. This means my work very often comes home with me, whether that be working on my various clinic patient conundrums, hand-rearing some fluffy urchins, or probably more likely studying towards my current physiotherapy diploma. When I’m not being boring and working, I like to spend time with my long suffering boyfriend & friends, as well as getting outside as much as possible, working on my allotment and generally relaxing!